Bolduc, Nutting and VanAntwerp received the District Award of Merit. 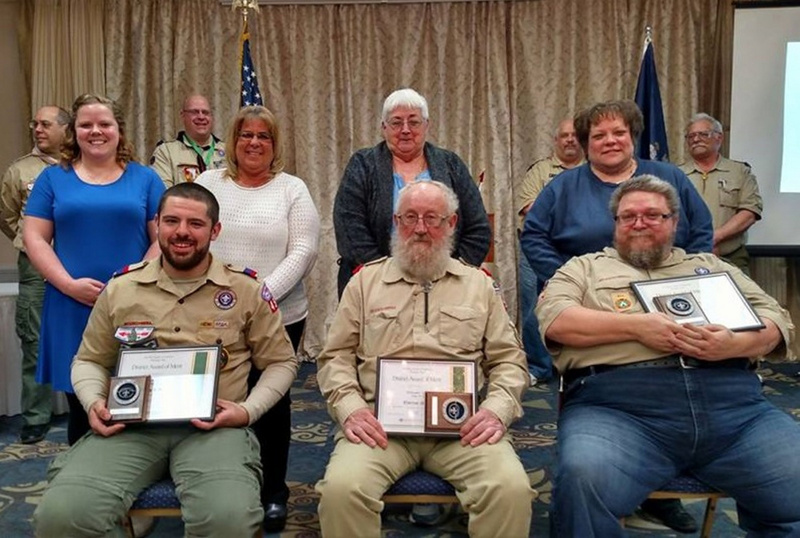 WATERVILLE — Three local Scouting volunteers received the District Award of Merit at the Kennebec Valley District Annual Scout Leader Recognition Dinner held March 25 at the Waterville Lodge of Elks. The three were selected by other Scouters for this high honor, the highest award a local Scouting district can bestow upon a Scouter. Contributed photo Three local Scouting volunteers received the District Award of Merit at the Kennebec Valley District Annual Scout Leader Recognition Dinner held March 25 at the Waterville Lodge of Elks. They are Jared R. Bolduc, Clarence "Buster" Nutting and Raymond "Jim" VanAntwerp. Front, from left, are Jared Bolduc, Clarence Nutting and Raymond VanAntwerp; middle row, from left, are Blair Rueger, Kathy Bolduc, Gayle Nutting and Wendy VanAntwerp; and background row, from left, are District Chairman Rick Denico, Jay Pfingst, Pat Couture and Chuck Smith. Jared R. Bolduc, of Oakland, is the Committee Chairman of Troop 454, where he has also served as an assistant Scoutmaster, earned his Eagle Scout rank, is passionate about the Order of the Arrow, and served on staff at various Scouting Camporees. Camporees he has assisted with include Maine Jam, but most know him through his work at Camp Bomazeen in Belgrade, where he volunteers as assistant ranger. He was nominated by Karla McAtee Talpey, of Jackman, and was joined at the awards ceremony by girlfriend Blair Rueger, of Waterville, and his mother, Kathy Bolduc, of Oakland. Clarence “Buster” Nutting, of Strong, is a member of American Legion Post 76. He has been involved in Scouting for many years. 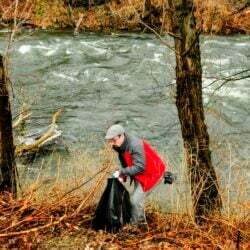 When his grandson joined Scouts, Nutting jumped in to help. When the boy and his family moved to Augusta, Nutting made the weekly trip from Strong to Augusta and even became Scoutmaster to ensure the program flourished. His grandsons moved in with he and his wife and he served as Cubmaster for the Pack in Strong and helped build the trailer needed for the troop equipment. He continued working with Scouts in Strong and Kennebec Valley District ever since. He has been helpful with camporees, the Bomazeen Old Timers (the Camp Bomazeen Alumni Association), and Camp Bomazeen’s summer programs. He was joined by his wife, Gayle, for the presentation. He was nominated by Chuck Smith, of Strong. Raymond “Jim” VanAntwerp is the assistant Scoutmaster of Troop 433 in Winslow and formerly a Cub Scout leader in Pack 445. He has taken training classes to expand his Scouting knowledge and to help him improve his delivery of the programs. He has spent the past six summers instructing youth on the safe and responsible method to handle, load, aim, fire and maintain a firearm as the shooting sports director at Camp Bomazeen. Patience and a deep desire to see youth learn to appreciate the skills involved in shooting, VanAntwerp is always ready to work with his son and any Scout that comes to the range. He was nominated by Scoutmaster Jay Pfingst of Troop 433 and was joined by his wife, Wendy, for the award ceremony. Kennebec Valley District delivers Scouting to youth in the following counties: Kennebec, Lincoln, Knox, Somerset and Franklin. The leadership of the district is Chairman Rick Denico, of Vassalboro, Commissioner Charlie Ferguson, of Winslow, and District Director Matt Mower. Past District Award of Merit Recipient Pat Couture, of Manchester, led the ceremony.